Atty. Jocelle Batapa-Sigue is Co-Founder and Past President, and currently the Vice President of the National ICT Confederation of the Philippines (NICP). She served as city councilor of Bacolod for 9 years and founded the Bacolod-Negros Occidental Federation for Information and Communications Technology (BNEFIT) in 2008, leading stakeholders to come together to promote Bacolod as a destination for ICT-enabled jobs and investments. She chaired the Bacolod IT Focus Team, which worked together on strategies and programs to develop Bacolod City and Negros Occidental as one the growing centers of innovation in the country. BNEFIT eventually joined similar bodies existing in other cities and provinces to create in 2008, the National ICT Confederation of the Philippines (NICP) now composed of more than 50 ICT councils nationwide. She served as NICP President from 2010-2012 and continues to be a trustee to this day. In 2012, she pioneered the clustering of NICP and served as lead convenor of the Visayas ICT Cluster Organization (VICTOR). In the same year, she was chosen as Asia Society Top Ten Philippines 21 Fellow in 2009 and Eisenhower Fellow of the Philippines. In March 2014, she was named as Philippine Individual Contributor of the Year during the International ICT Awards given by the Canadian Chamber of Commerce and Industry in the Philippines. Since then, she has continuously pushed for policies for the State to provide an environment that will support investments in cost-efficient ICT infrastructure, systems and resources, to ensure universal access and high-speed connectivity at fair and reasonable costs; a level playing field for strategic alliances with investors in order to have balanced investments between high-growth and economically depressed areas; ensure consumer protection and welfare as well as preserve the rights of individuals and entities to privacy and confidentiality of information; to promote accountability through transparent governance, and effective delivery of government frontline services. She chaired the NICP eGov Awards or the Awards for Excellence in ICT for Good Governance. Since 2012, the eGov Awards started as the first and most prestigious annual recognition to be given by the ICT sector to LGUs with exemplary performance in utilizing information and communications technology (ICT) to effectively and efficiently deliver its public services directly to its constituents and to its business stakeholders and towards raising the bar in delivering public service. By drawing attention to the best practices in integrating ICT capabilities and solutions, the different sectors of society, government units are enabled in their roles as catalyst of change. It is hoped that with the eGOV awards strategy, the country will see the proliferation of revolutionary ICT initiatives that will support clearer, wider and faster access to information in our local governments. She developed the Negros First CyberCentre and the first Technology Business Incubator (TBI) for tech startups in the province. In 2016, she founded the Philippine ICT Innovation Network which seeks to create platforms for all ICT champions to collaborate on seeking solutions and strategies for the Philippines to thrive in the digital age. It is a coalition of individuals, groups and organizations with long years of proven track record as key actors in the ICT sector, who share the common vision of championing the use of ICT and the uplifting of the ICT sector as growth drivers of the economy of the Philippines by ensuring that the sector is adequately, competently and effectively represented in the Congress, as the highest policy-making body of the country. 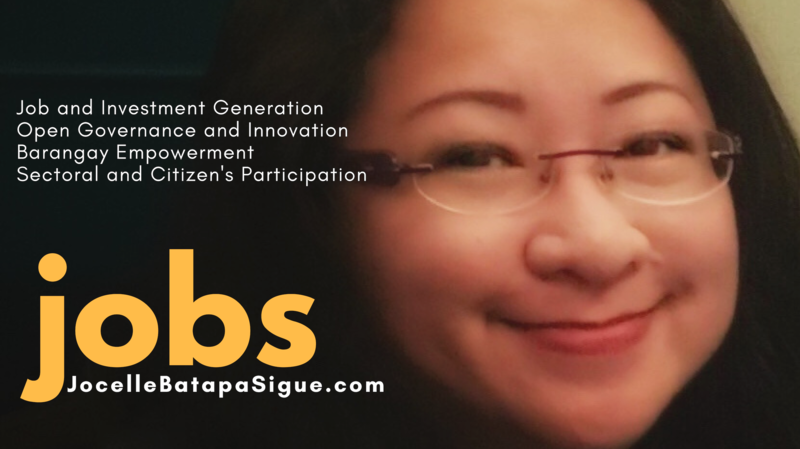 Her passion is to help build ICT councils in the countryside as a venue for academe, government and industry to come together and develop strategies to generate ICT-enabled jobs and investments and drive innovation. In 2016, she was named as one of The Outstanding Women in Nation Service (TOWNS) awardee in the field of ICT. Known as a staunch advocate for the development of ICT in the countryside, she completes the eight awardees in this prestigious recognition for women not more than 45 years old given by the TOWNS Foundation every three years. Her efforts and initiatives promote the interest of the youth and the nation-building – and beyond that – she has consistently championed INCLUSIVE growth as a principle for nation-building and considers ICT as the global key driver to economy, governance and social development in the world today. She is a leader that sees the world as her space, unbound by parochial thinking. She believes that she must not only help Bacolod but other cities by inspiring them to unite, strategize and dream big.